Lemon, lemon and lemon. When the ingredients transform into various forms and flavours, lemon will blend into it perfectly. 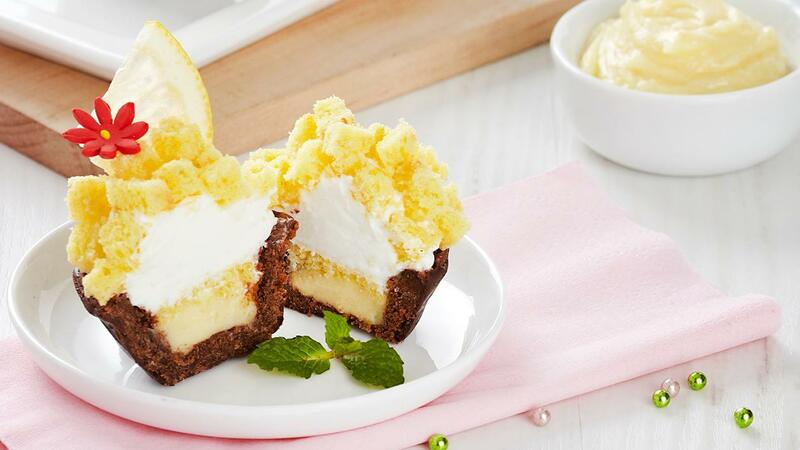 The freshness of lemon will freshen all food lovers. It is so unforgettable! Mix all the ingredients (except the water) using our hands until they become granules and pour the water. Mix them all until they become a clot dough. Put in the chiller for 30 minutes and press it. Mold the dough in the mini muffin molds and bake them about 15 minutes in 160⁰C. Mix the sugar, eggs, cake stabilizer using a mixer until they are getting white and swell. Then, add the dry ingredients and the lemon peels and mix them well. Add the melted margarine and mix them well. Put it into a circle pan using 22/24 cm in diameter pan and bake it in 180⁰C for 15 minutes. Mix white shortening and margarine until they are smooth. Add the soft cream, stir them for a while and pour simple syrup/ melted sugar and mix them using a mixer until they are soft and smooth. Mix the grated lemon peel and instant vla. Add some butter cream and mix tem well until they are ready to be use as the filling. Coating the base chocolate tart skin, leave it for a while. After it crusts, add some lemon vla. Put the round lemon sponges on the top and cover it again with the lemon vla. Next, put the butter cream on the top and arrange little lemon sponges until they cover the butter cream. Then, add the sliced lemon and heart-shaped chocolate on the top of the cake as the toppings.